As per as translation of Quran in Urdu language is concerned there are some good translations but need of a good Tafseer-e-Quran was very much needful. The tafseer which could be understandable for common people and which could give answers of the today’s world. After feeling this need Allama Safdar Hussain Najafi went to Iran and seen many of Tafaseer. As per advices of many of Ulamas and search of him, he reached on the common point that Tafseer-e-Namoona which is written by Grand Ayatullah Nasir Makarim Shirazi with his team is the best tafseer which provides answers for the questions and doubts of this era. After that he did the translation of Tafseer-e-Namoona in Urdu language which is easy to understand and a big asset for Maktab e Ahlalbait (a.s) in Urdu language. 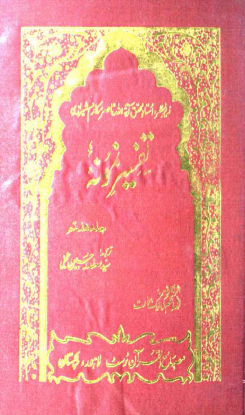 This translation of Tafseer-e-Namoona is consists of 27 volumes and this is the 7th part of them.